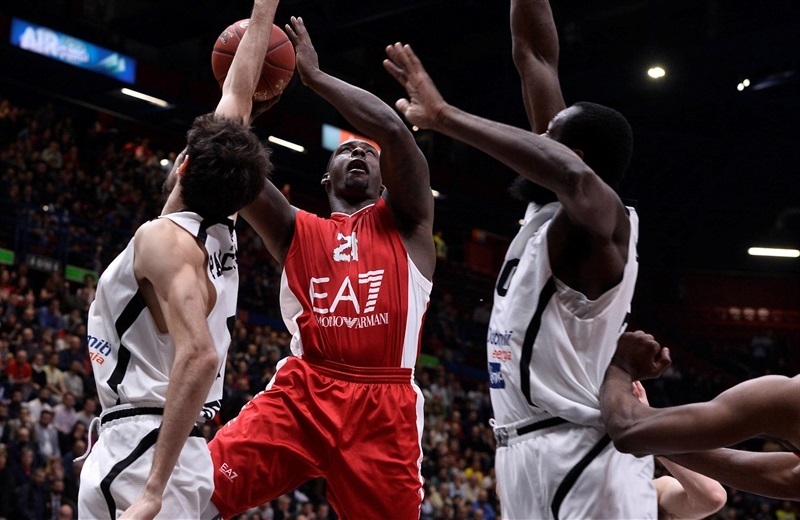 Dolomiti Energia Trento’s magical Eurocup run continued Wednesday with a 79-92 victory to sweep Italian League rival EA7 Emporio Armani Milan and clinch a berth in the semifinals. 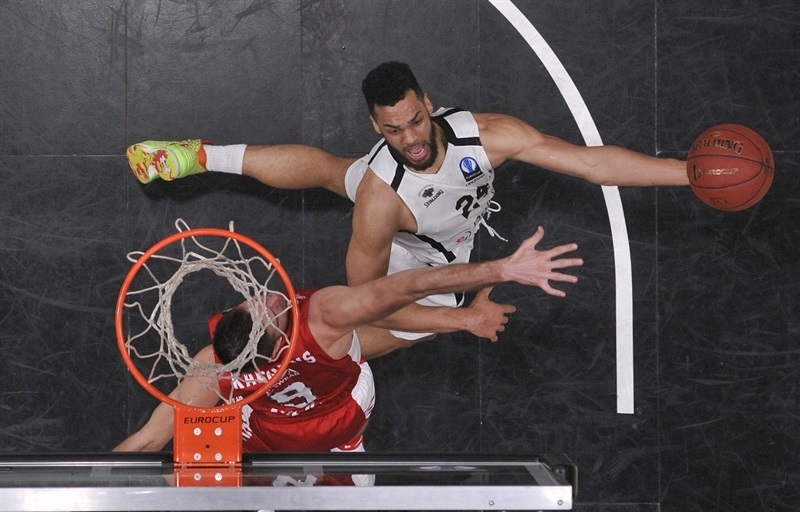 Trento came into the two-game, total-points series with a 10-point advantage after winning Game 1 at home 73-83 a week earlier, but that lead proved unnecessary as it took a 5-point lead after 10 minutes, doubled it in the second quarter and never trailed again. 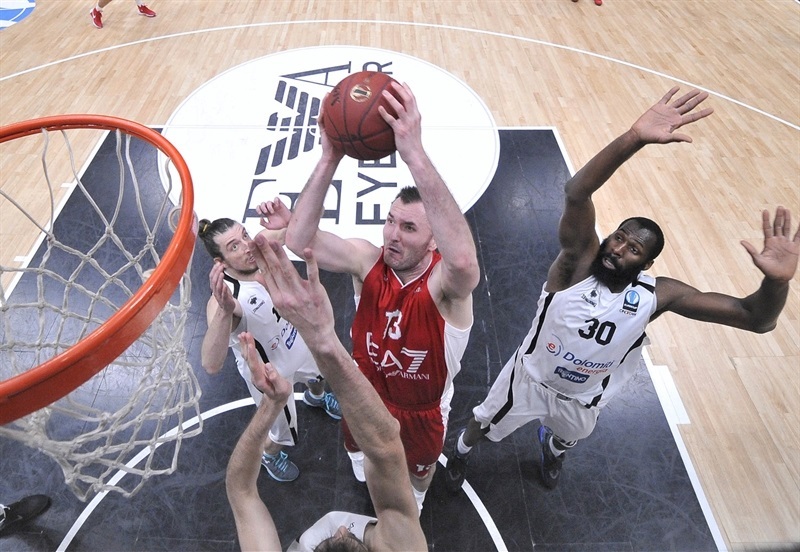 The Eurocup newcomers will next face Strasbourg in the semifinals. Dominque Sutton starred with 20 points, 8 rebounds, 7 assists and 3 steals to lead six Trento scorers in double figures. Davide Pascolo posted 17 points and 7 rebounds, Trent Lockett and Julian Wright contributed 13 points apiece, Giuseppe Poeta scored 12 and Andres Forray 10. 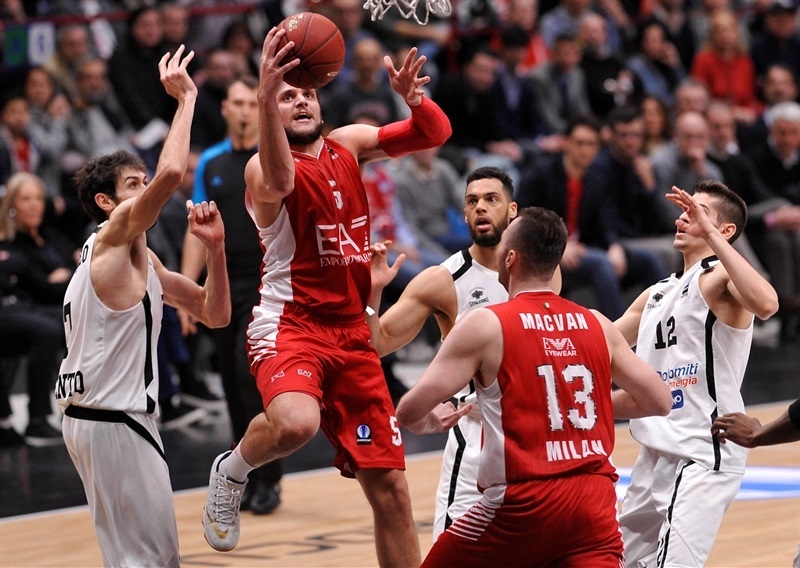 Kruno paced Milan with 14 points, Milan Macvan scored 13, Jamel McLean tallied 12 points and 12 rebounds, Rakim Sanders added 11 points and Mantas Kalnietis 10. 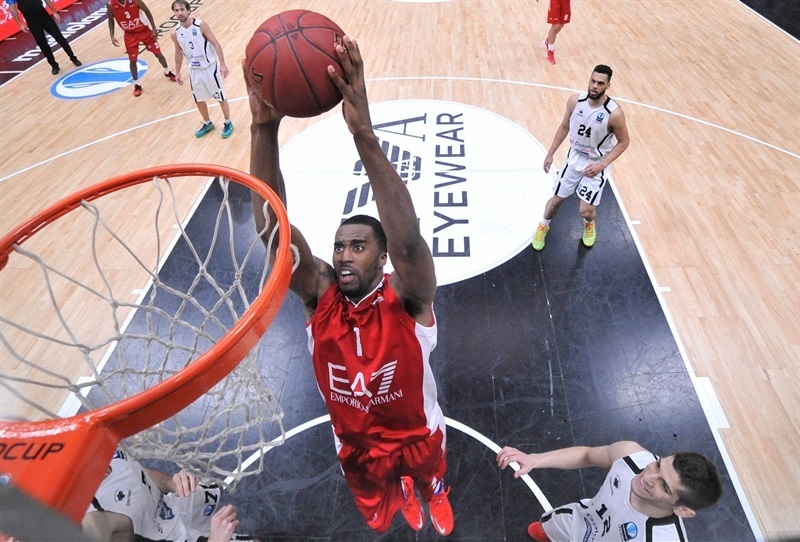 Milan won the opening tip and struck first through Stanko Barac before Lockett got Trento on the scoreboard. The teams traded baskets and leads early before 4 straight points from Wright and a Lockett layup made it 12-19 (and 85-102 on aggregate) with three minutes left in the first quarter. Simon’s three-point play closed the gap and McLean scored too, but a Poeta triple ended the first quarter with Trento ahead 19-24 (and 92-107 on aggregate). Sutton scored once and assisted twice in a 0-6 run that gave Trento a double-digit lead in the game and a 20-point boost in the series just three minutes into the second quarter. 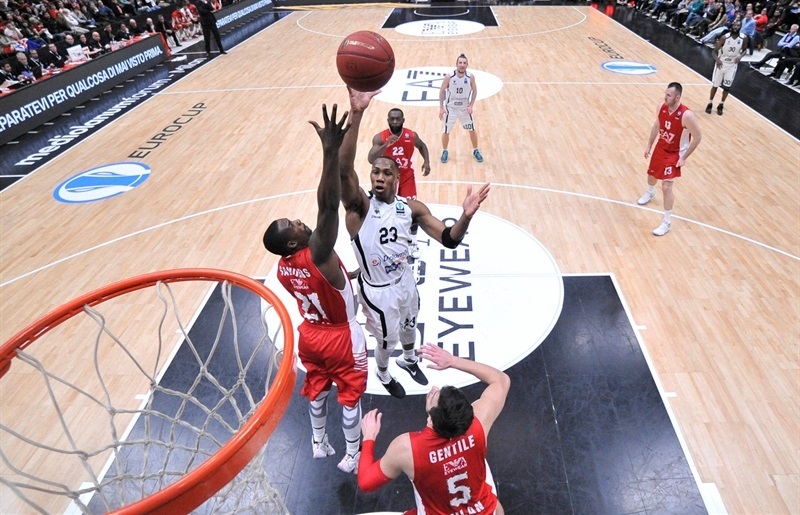 Sanders hit back with a pair of threes for Milan, which closed to 30-34 (and 103-117 on aggregate). After Wright connected from downtown, Alessandro Gentile scored twice for the hosts, but was matched by Sutton’s baskets. Kalnietis netted free throws and fed Macvan, who brought Milan within 2, but Trento protected its lead through Forray’s three-pointer. 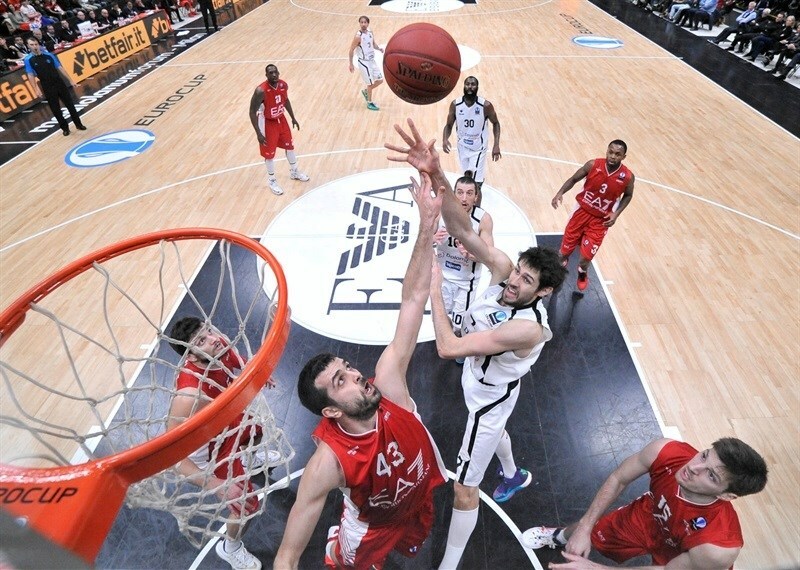 Simon made it 43-48 (and 116-131 on aggregate) at halftime. Sanders started the second half with a three-pointer, however Trento pushed on with 3 points from Luca Lechthaler, a second Forray three as the difference ballooned to 49-60 (and 122-143 on aggregate). The difference continued to grow, despite Poeta’s unsportsmanlike foul on Macvan, who split free throws and Oliver Lafayette followed with a basket. Pascolo’s triple ended the quarter at 54-69 (and 127-152 on aggregate). Milan held the visitors scoreless for the first three minutes of the fourth quarter, but has only a basket each from McLean and Kalnietis during that period. McLean scored twice more, however Trento fired up its offense again and led 64-77 (and 137-160 on aggregate) midway through the quarter. 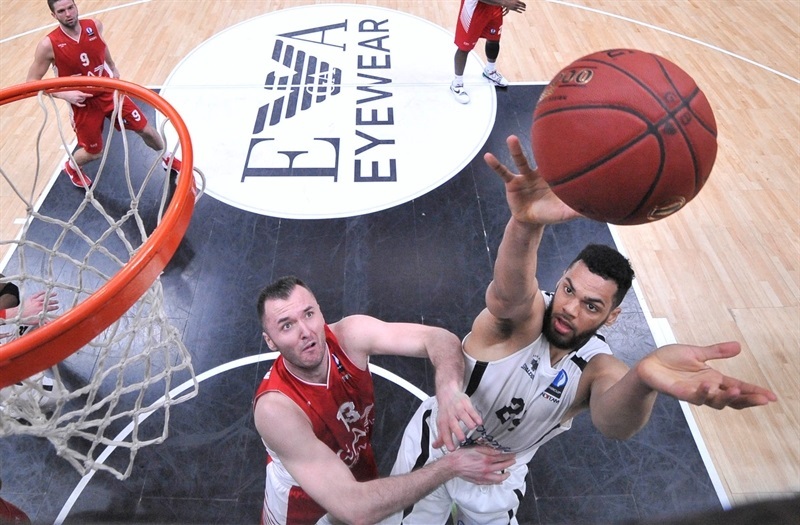 Milan sought one last run with threes by Kalnietis and Lafayette, but the outcome was never in doubt as Trento coasted to a series sweep and a semifinals berth. "We achieved a great victory, which gives us a place in the semifinal and represents a historic achievement for the club and for all the people who work there. We were good to play without bothering to do addition and subtraction, thinking only of winning the game. We defended well and had patience on offense without being caught up in the hustle and bustle. Sutton and Lechthaler played a great game, using their own abilities to benefit the team."